Sometimes it feels like the universe is conspiring against you and I’m having one of those weeks where I’m being pulled along with gentle nods here and there that I’m right where I should be. It’s an odd feeling because usually, I feel like life is a never ending battle to get it to do what I want it to. It’s funny that today’s prompt should be Local because this week that is all I am talking about. This week I am curating the Smallholders Ireland account over on Twitter and I’m taking this amazing opportunity to talk about growing your own food and how we manage to do that here at the cottage. I will be chatting about my previous life as a Chemist and how that has affected our water choices here and how important it is to introduce your kids to the garden and why shopping local is more than just a trendy phrase. 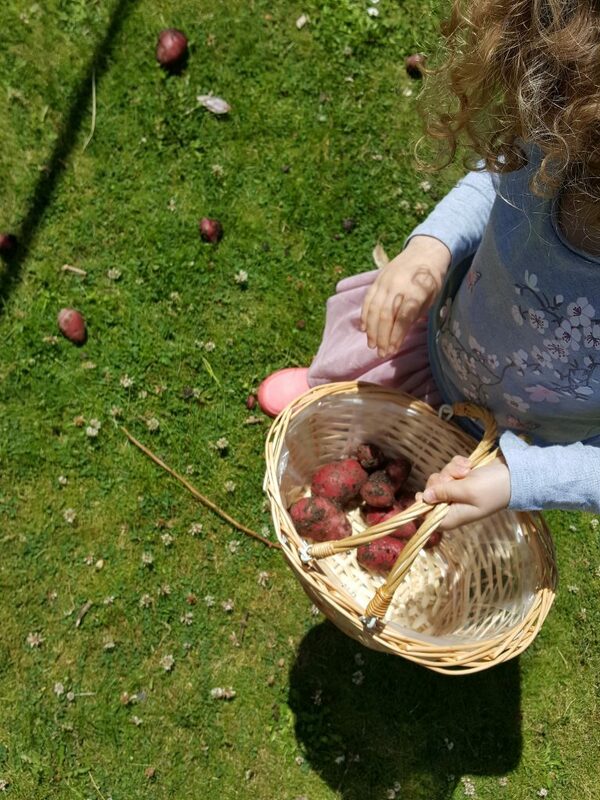 If you have been following along on our adventure so far you know that my sanity comes from getting the kids out and in the garden and this weekend was the beginning of my favourite season; the season of The Great Potato Hunt!! 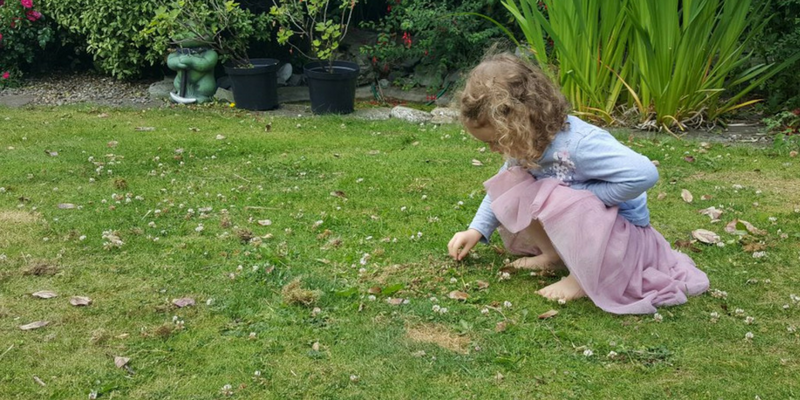 Every Saturday we turn over a bag of potatoes we have growing and the girls hunt for potatoes in the soil with their hands. They each have their own baskets and it’s a race, OK a rather unfair race to see who gets the most. When we have nothing to harvest we try to shop local with as little plastic as possible. We use reusable containers for the butcher, we use Tesco home delivery when we really have to and we buy directly from local producers at markets.By doing this we try to make our footprints smaller on our planet and we try to support the local economy and producers so that they can continue what they love to do. I’m a firm believer in community because who doesn’t need a bigger family right? For me, the word local is much bigger than it’s combination of five letters. It encompasses community, the environment, skillsets, businesses, food and the future. I haven’t even touched on my other big love of local yarns etc. I have to believe that even though we are just four people that our choices can make a difference both locally and to the environment and to others otherwise the overwhelming thought that it is all hopeless is just too much to bear. The choice to build a world for us and our girls that we want to live in has to be worth it and when our girls are older that they will appreciate our efforts. They will have memories of eating warm fresh peas directly from the plant, they will know what homegrown salad and veggies taste like but also the skills to grow them if they need to in the future. I want to believe that these choices and making a difference now can change the future and that it’s not already written. I’ll meet you back here in a decade and then again in two decades and I’ll let you know how it’s going. A lovely post! I do believe small actions can truly make a difference. I’ve grown up visiting my grandparents’ farm, and when I have children, I’ll want the same for them. It’s amazing the memories that we keep as we grow older and the ones that are most valuable to us.